Bronze mask. Signed under left edge. Bearded, slightly turned so that right ear is cut. On wood block. Richard E. Brooks was a sculptor who studied in Paris under Jean-Paul Aube and corresponded with a Mr. Thomas about the Rodin piece. In a letter likely written fall 1901, Brooks says he went to see Rodin, who wanted 1000 francs for "l'homme au nez casse." Brooks says he could get it through "a Frenchman" for 800 francs. By October 15, 1901, Brooks had the sculpture in his studio and had packed it for shipping by January 28, 1902. In a December 11, 1903 letter to Mrs. Thomas, he says, "…The man that bought Rodin's "Mask" neglected to ask for a receipt, as it is not customary among artists + I doubt if Rodin would have given one, because he insisted that his price was 1000 francs, however, I shall write him asking what he will sell us a bronze copy for." 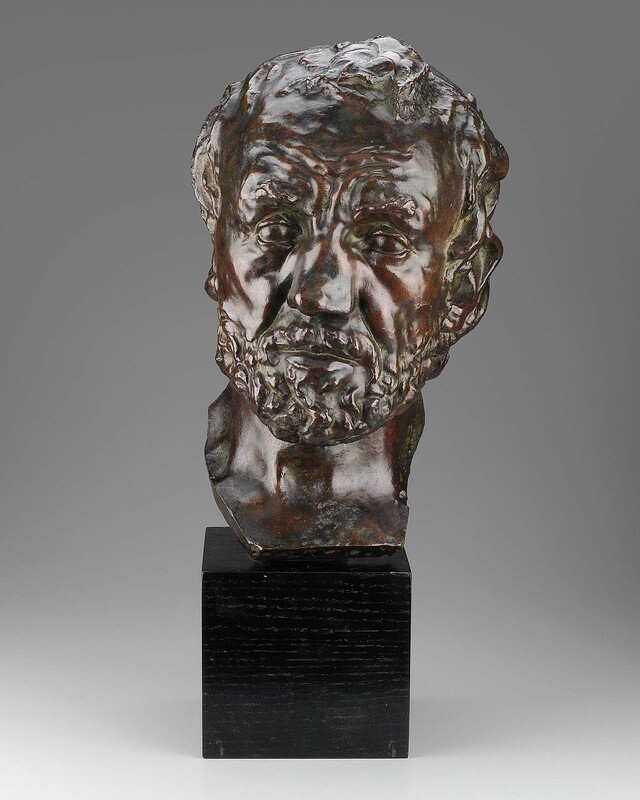 See MFA committee notes: "The former owner [Brooks] writes of having purchased it directly from Rodin. It was Charles D. Childs (169 Newbury Street) who suggested to Mr. Kulp that he offer it to the MFA..."